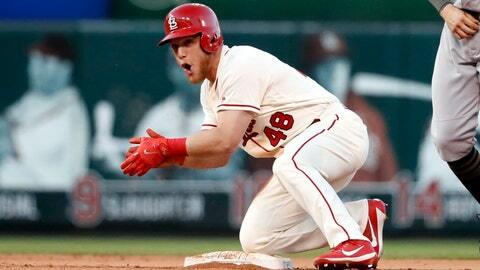 Harrison Bader's RBI single lifted the Cardinals to a 7-6 comeback win over the Brewers on Saturday. Milwaukee’s loss clinched the second NL wild card for Colorado, which plays at division rival Arizona in the Wild Card game Wednesday. Santana’s 30th home run, a 428-foot shot to right-center field, and Shaw’s two-run single highlighted a five-run third for the Brewers. Shaw’s single gave him 100 RBIs in a season for the first time. Cardinals: The club announced following Saturday’s game that RHP Jack Flaherty (0-1, 6.06 ERA) will start the season finale, replacing the originally scheduled starter, RHP Carlos Martinez. He will be facing Milwaukee for the first time.